The Special Deliveries Childbirth Center supports breastfeeding, and has been designated a Baby-Friendly Facility by Baby-Friendly USA, part of UNICEF’S Baby-Friendly Hospital Initiative. Hartford Hospital is the 28th Baby-Friendly facility in the U.S. and the first in Connecticut. As a Baby Friendly hospital we are committed to providing optimal support to help you be successful with breastfeeding your baby. Education before and after your baby is born. Our nursing staff is trained in helping you initiate breastfeeding with your baby. In addition to this excellent care and support, there is a lactation center right on the Maternity Unit with certified lactation consultants available 7 days a week. For more information or to make an appointment, please call the Lactation Center at 860.972.2824. Hospital-grade breast pump rental or purchase is available through the Hartford Hospital Gift Shop located in the main lobby. The number is 860.972.2155. 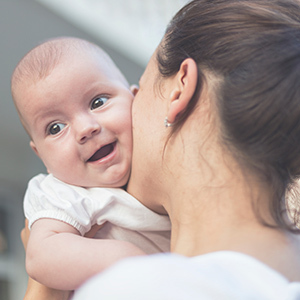 For expectant mothers receiving care at Women’s Ambulatory Health Services, there is a program, free of cost, to provide support prenatally, and during and after your hospitalization. For more information, contact our Peer Counseling Program at 860.972.6195. It’s important to learn as much as you can about breastfeeding before your baby’s birth. We provide a variety of resources. If you are interested in a Breastfeeding class, check out our Breastfeeding With Success Classes. Our program at Healthy Baby Essentials works directly with lactation staff to help new moms obtain a breast pump. Breast pumps are now covered with no copay or deductible by most insurance plans. Healthy Baby Essentials has a customer service representative staffed at Hartford Hospital outside the Maternity Unit on the 6th floor in Bliss 653 seven days a week between 11 a.m. and 2 p.m. If you would like to speak with a representative outside of these hours, call 1.888.495.7491. Lactation Consultants are health workers who are specially trained and experienced in helping breastfeeding mothers. Many in the community have breastfeeding equipment and supplies for rental or purchase. There may be a fee to see a consultant. It is recommended you speak with your pediatric provider to review the lactation services available to you at their office. Lactation Services are available through Hartford Hospital’s support group or lactation center. Please call 860.972.2824 for a private appointment. No Registration Required. For Questions, call 860.972.2824.